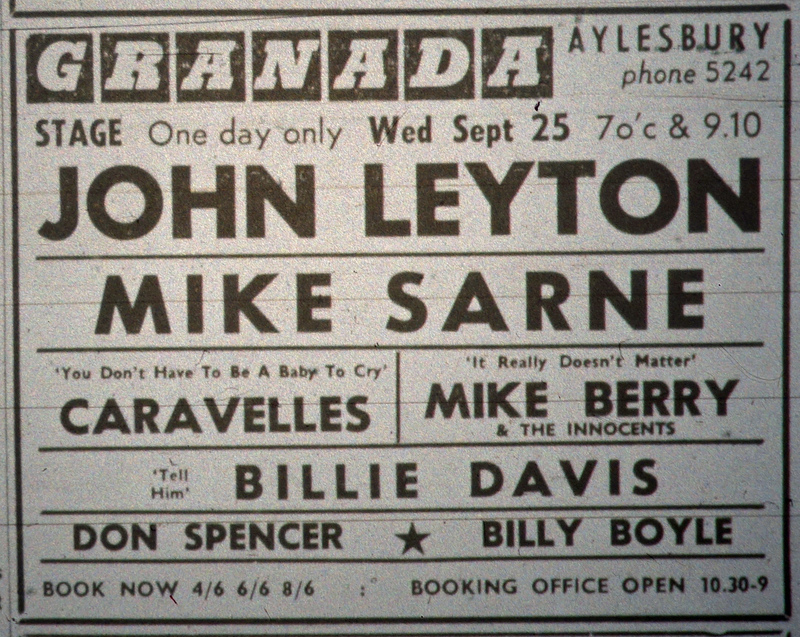 There were just five stage shows held at the Granada during 1963. The first on 23rd January was Jimmy Saville introduces Juke Box Doubles – something like Thank Your Lucky Stars, with the acts impersonating other, better-known artists. There was, for example, Brad Newman as Elvis, Steve Francis as Billy Fury and Dru Harvey as Gene Vincent. 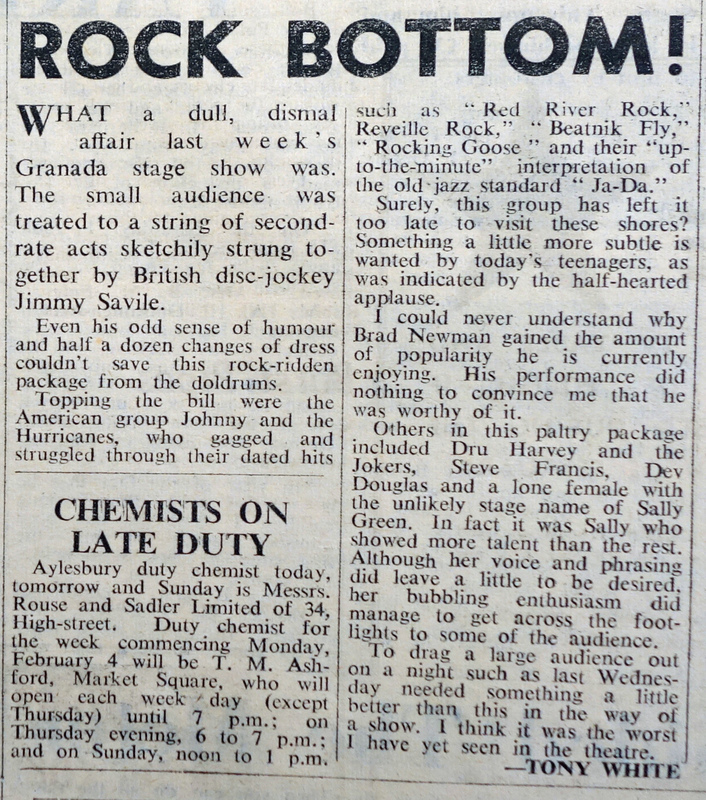 Johnny and the Hurricanes were top of the bill and appeared as themselves! What a dull, dismal affair last week’s Granada stage show was. The small audience was treated to a string of second-rate acts sketchily strung together by British disc jockey Jimmy Saville. 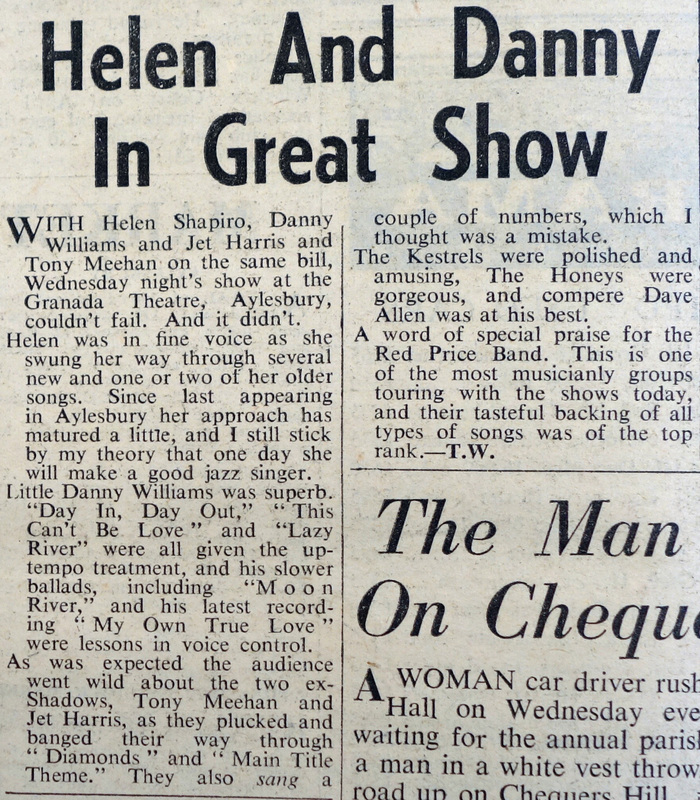 The tour also struggled in other towns.- and the last seven dates of the tour were cancelled by promoter Don Arden, although Johnny and the Hurricanes continued to appear. 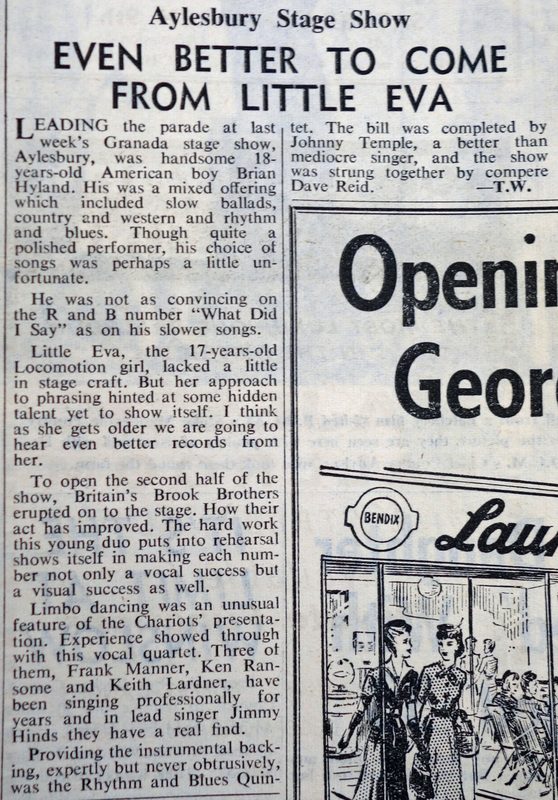 Little Eva, the 17-years-old Locomotion girl, lacked a little in stage craft. But her approach to phrasing hinted at some hidden talent yet to show itself. I think as she gets older we are going to hear even better records from her. Helen Shapiro returned to the Granada on 20th March. The support acts included Jet Harris and Tony Meehan and Danny Williams, with comedian Dave Allen as compere. Bobby flew into the country on Saturday for some recording sessions, was told by a friend that Jet and Tony were appearing at Aylesbury on Wednesday, and without hesitation travelled up with his manager Frank Day to see them. It was the first time they had met since 1961, when Jet and Tony were touring the States with Cliff Richjard and The Shadows. 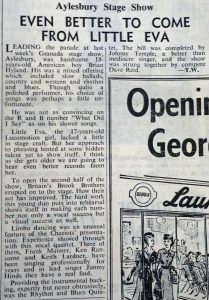 Bobby was appearing on the same bill then and became firm friends with the two British stars. 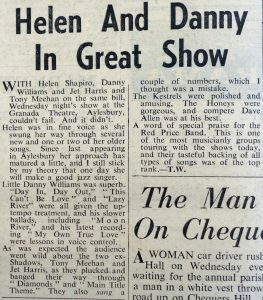 With Helen Shapiro, Danny Williams and Jet Harris and Tony Meehan on the same bill, Wednesday night’s show at the Granada Theatre, Aylesbury, couldn;t fail. And it didn’t. 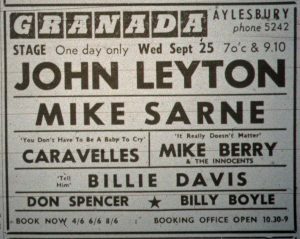 There were no more shows until 25th September, when John Leyton and Mike Sarne topped the bill. 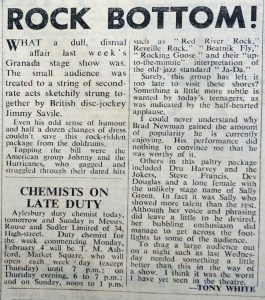 The final show of the year was on 24th October, with Joe Brown and his Bruvvers, the Big Three and the return of Johnny Kidd and the Pirates.